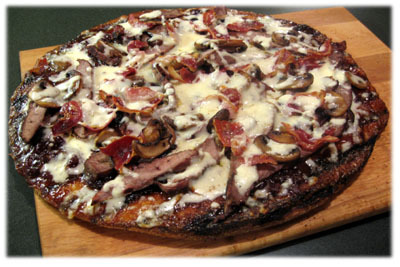 Strips of tender, juicy grilled Sirloin is what gives this cheese steak pizza it's unmistakable flavor. 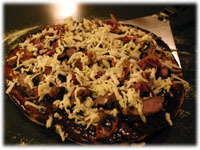 Brush your favorite BBQ sauce on the grilled pizza dough and finish off by topping with sauteed onions, mushrooms, panceta and provolone cheese. 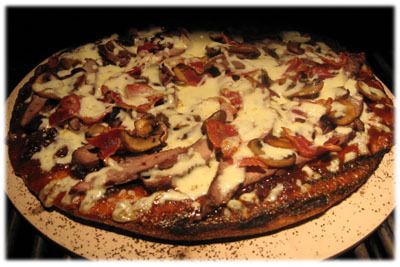 Some folks also call this a Philly Cheesesteak pizza. 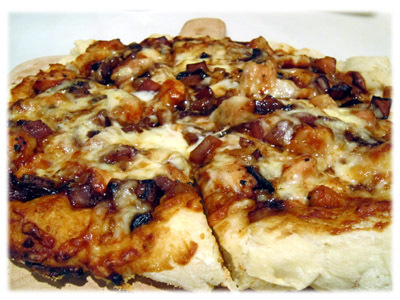 You can make your own pizza dough or buy pre-made dough from your local bakery or supermarket, like I did with this recipe. Grill only one side of the dough for 2 minutes at 500F then remove it from the grill and add your toppings to the grilled side of the crust. You'll be finishing this off in the BBQ on a preheated pizza stone for best results. 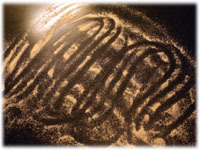 Coat the inside of a large mixing bowl with oil. 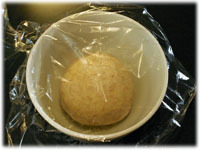 Cover a softball sized piece of dough with oil and place in the bowl. Cover with plastic wrap and let rise until doubled in size. 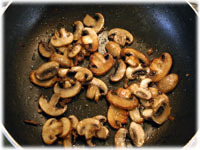 Sautee the mushrooms, onions and pancetta bacon and set aside. 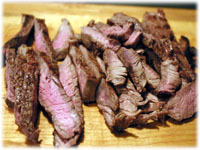 Rub a little oil over both sides of the sirloin steak and sprinkle with kosher salt. Grill at 600F for about 3 minutes a side. Keep it a little on the rare side as it will cook a bit more when on the pizza. When cooked slice it into thin 1/4" strips. Sprinkle some cornmeal on your counter or working surface to keep the dough from sticking. 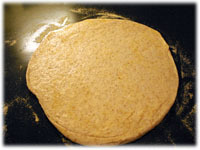 Place the risen dough on the cornmeal and roll it over to completely cover the ball of dough in cornmeal. 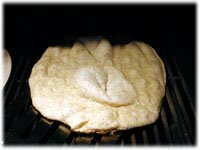 With a rolling pin flatten the dough until it's almost the same size as your pizza stone (any bigger and it's edges will flop over and burn). Preheat the grill to 500F direct heat. 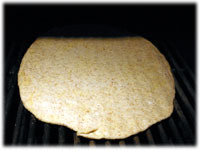 When the grill's reached this temperature carefully lay the flattened dough directly on the grates from back to front. After 1 minute lift the lid and carefully poke any bubbles that have formed with your spatula so they collapse. Close the lid for 1 minute more. 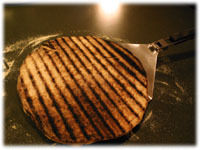 When the 1 minute is up lift the lid and remove the crust (using a pizza peel) from the grill. Place the cooked side up on your working surface. It's important not to overcook the dough when it's over direct heat. At 500F it will be perfect after only 2 minutes. 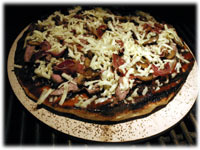 Place the pizza stone on the grill to warm up while you put the toppings on the pizza. Add the BBQ sauce to the top of the cooked side of the crust and smear to cover it completely. 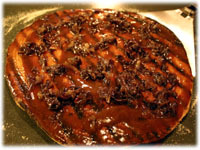 Add the sauteed onions on top of the sauce. 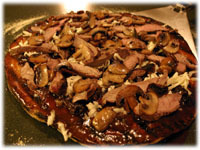 Sprinkle half the provolone cheese on top of the onions and add the steak and sauteed mushrooms. Sprinkle the rest of the provolone cheese on top and add the sauteed pancetta bacon. Place the cheese steak pizza on the preheated stone and close the lid. After a couple minutes lift the lid and check if the cheese is melting. Also check under the pizza to see if the bottom of the crust is browning up. It should only take about 3 minutes on the grill to cook the pizza. Remove the pizza from the grill, slice and serve immediately.